The “Mettlach: Medieval to Modern” exhibition presents a journey into the history of European art and philosophy, from the Enlightenment to the modern times, through tracing the evolution of the decorative imagery of Villeroy & Boch (V&B) ceramics. Francois Boch established the company in 1748, in Audun-le-Tiche, France. In 1809, the Bochs bought the Benedictine abbey in Mettlach on the banks of the Saar River, which would become their most industrious and most recognized location. Not much later, the Villeroy family joined the Bochs in a merger, making V&B one of the most successful companies in continental Western Europe. When Villeroy & Boch started their factory in Mettlach, exciting changes in the social and economic life of Western Europe were taking place. The Enlightenment movement in Europe, with its emphasis in human reason, was manifested in many achievements in science, math, and philosophy. The subsequent period, the Industrial Revolution (think steamboats, railroads, and other), was fundamental to the Mettlach success. The new industries were changing the landscapes of cities and towns, which were bustling a growing middle class. The new metropolitan residents became interested in financial security, urban life, culture, art, and overall social well-being. The following period, Romanticism, was a reaction to the industrialization of the social life. Romantic writers and painters highlighted the splendor of nature and man’s spiritual relationship with it, and drew inspiration from classical mythology and folk tales. Many Mettlach ceramics clearly display romantic themes, such as the Grimm Brothers fairy tales, German myths, idealized rural landscapes, and representations of famous Romantic composers (Beethoven, Strauss, Schubert, etc.). 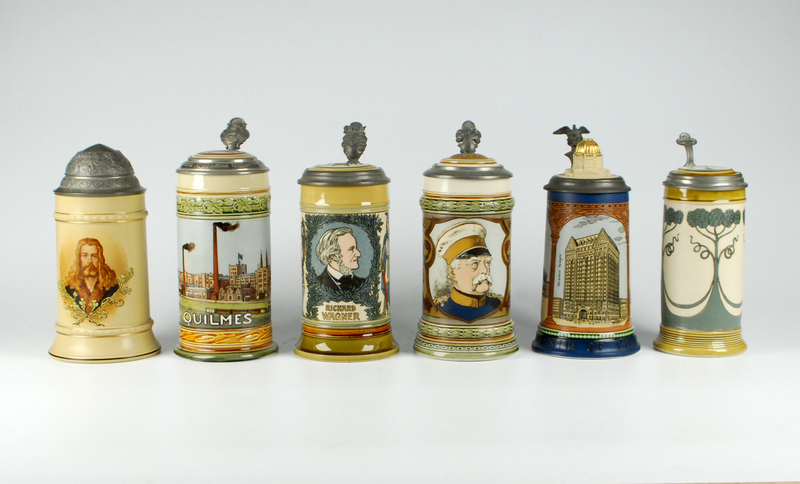 The V&B ceramic factory in Mettlach produced a large number of steins with symbols of German nationalism. The rise of nationalism in Europe was partly due to Romanticism’s strong emphasis on ethnic folklore and mythology. The German Empire was created in 1871 when several German-speaking kingdoms merged. This unification coincided with the most productive period for V&B, as Mettlach products became popular in all German-speaking areas. A large section of the exhibition is dedicated to the profound stylistic changes in European art generated by the Arts and Crafts movement. Some of the most esthetically pleasing Mettlach ceramics were produced during this period of art history. First and foremost, the Art Nouveau (or Jugendstil in German) introduces new decorative designs, such as winding plants, curvilinear floral motifs, female figures, and a general lack of symmetry. In the 1920s, Art Deco took over and became the dominant style even for Mettlach wares, displaying geometric motifs and lots of symmetry. Then, the 1930s and 40s brought about a more developed stage of modernism. The German school of design – Bauhaus, which sought a more integrated approach for aesthetic manifestations in all extents of social life, stressed simple, elegant, and functional forms, enhanced with complementary geometric decorations. AMOCA’s Mettlach exhibition is made possible by Robert D. and Colette D. Wilson, who accumulated over 3,000 Mettlach ceramic objects over a 30-year period. AMOCA now houses their entire collection (dating from c. 1840-1915) in the world.